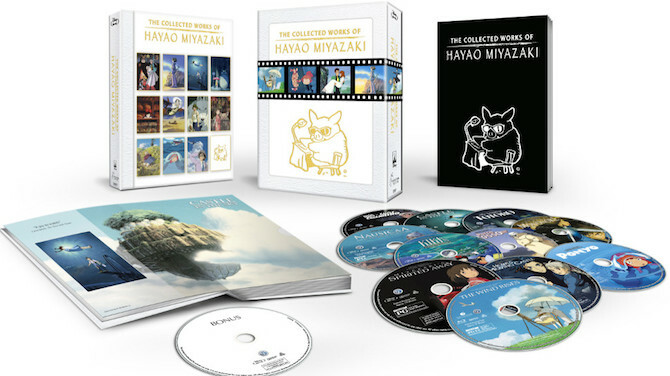 In a long awaited arrival, the complete Collected Works of Hayao Miyazaki will arrive on Blu-ray, November 17th exclusively from Amazon. With Miyazaki now planning on making an additional movie, Disney decided to celebrate his return by releasing an incredible set limited to Blu-ray. The Collected Works of Hayao Miyazaki will feature Lupin the Third: The Castle of Cagliostro, Nausicaä of the Valley of the Wind, Castle in the Sky, My Neighbor Totoro, Kiki’s Delivery Service, Porco Rosso, Princess Mononoke, Spirited Away, Howl’s Moving Castle, Ponyo, and The Wind Rises. A collection of incredible animated movies that have been slowly releasing on Blu-ray already. Miyazaki fans everywhere have already been buying these films in high definition, so what incentive is Disney offering to make us double dip? The set’s bonus features, include Yuki no Taiyo (Yuki’s Sun), a 1972 television pilot based on a manga by Tetsuya Chiba that was directed, storyboarded and animated by Hayao Miyazaki. Additional features also include 3 episodes of the 1972 anime series Akado Suzunosuk (Little Samurai), featuring storyboards by the filmmaker. Fans will also get the uncut version of Miyazaki’s Retirement Press Conference, which is now thankfully celebrating nobody’s retirement. Finally the set will come out in special edition packaging with an exclusive art book. I know I’m buying another round of Miyazaki.